And since kids tend to spend more time indoors in the fall and winter months, and younger children in particular tend to play closer together and share toys and other classroom items, infections are easily passed from one person to another. "People think there are more viruses in the winter, but in winter, there is more people-to-people contact," says Henry Bernstein, DO, professor of pediatrics at Hofstra Northwell School of Medicine in New York and a spokesperson for the American Academy of Pediatrics. "Windows and doors are shut, and therefore viruses are spreading more." Here are some illnesses kids typically pick up at school, and what parents should know about common symptoms, prevention tips, and when to call the doctor. As common as it is, the influenza virus is dangerous: It is responsible for thousands of death each year, and not all of those victims are among the high-risk populations. "The vaccine is recommended each and every year for children 6 months of age and older," says Dr. Bernstein. Symptoms often include a quick onset of illness, a high fever (103 degrees or higher), body aches and chills, headache, severe exhaustion, and decreased appetite. Your child may also have a cough, sore throat, and in some cases, vomiting and/or diarrhea and belly pain. Many respiratory illnesses, including strep throat or pneumonia, can resemble the flu, so call your doctor if you see these symptoms, says Dr. Bernstein. 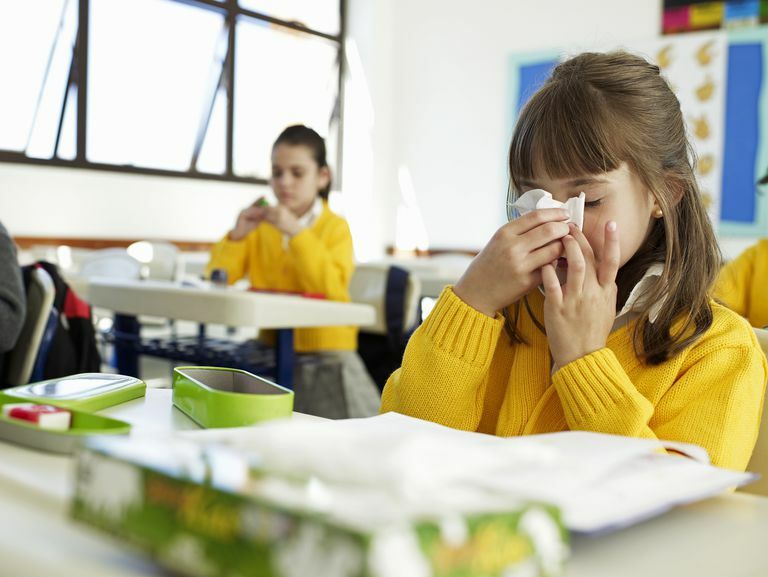 Prevention tip: One of the most common ways colds are transmitted is when a child comes into contact with a cold virus and then touches her eyes or nose. Make sure your child washes her hands properly often, and remind her not to touch her eyes, nose, or mouth. You can also help keep your child's immune system healthy by making sure she gets enough sleep, eats a healthy diet, and gets lots of exercise. Pinkeye, or conjunctivitis, is an inflammation or infection of the clear membrane that covers the white part of the eyeball and the inner surface of the eyelid. This common eye disease can be caused by a bacterial or viral infection as well as allergies, pollutants such as smoke, chemicals in cosmetics, or chlorine in pools. A child may complain of eye irritation or a sensitivity to light and you may see excessive tearing or discharge, swollen eyelids, and a redness in the whites of the eyes (hence the name "pinkeye"). Prevention tip: Pinkeye is easily passed from person to person (a child can get pinkeye by touching something that an infected person has touched, and then touching his own eye), which is why children who have been diagnosed with conjunctivitis are kept out of school until they've started treatment and are no longer contagious. Remind kids often to not touch their eyes, nose, or mouth, which is a good way to help ward off pinkeye as well as other infections. This common infection in kids is caused by a strain of bacteria called group A streptococcus. Strep throat is highly contagious and can spread through airborne droplets when someone who has the infection sneezes or coughs. Strep throat can also be transmitted through sharing drinks or food, or by touching a surface such as a doorknob that is harboring the bacteria and then touching one's own eyes, nose, or mouth. Your child may complain of a sore throat and pain when swallowing, and she may have a fever, rash, headache, nausea or vomiting, tiny red spots on the back of the roof of the mouth, and swollen tonsils. Also called "stomach flu" or "stomach bug," gastroenteritis is inflammation of the stomach and intestines, which can lead to vomiting, diarrhea, stomach cramps, and fever. Gastroenteritis can be caused by bacteria, a virus, or a parasite. When kids are fighting a stomach bug, the most important thing to remember is to keep them well hydrated. "Bodies tend to not work well when they are dehydrated," says Dr. Bernstein. Have kids sip water or a rehydration solution (such as Pedialyte or Gatorade) that contain electrolytes, which become depleted when a child throws up and has diarrhea.